Social Security answers that clients understand. Social Security Pro's intelligent calculations move you quickly from Social Security questions to financial solutions. The extensively researched, patented user interface is so easy to use that we recommend you turn it over to your client. Let them select benefit start age combinations (just click or touch a square in the grid). They can see for themselves how the choices they make interact to affect their lifetime benefits. Research has proven that the more involved your prospect is in the decision making process, the more committed they are to the final decision. The easy interactivity of Social Security Pro is the ultimate in prospect engagement. There's never been a simpler way to apply the thousands of Social Security rules to your client's goals. Touch or click on a start age combination in the interactive grid. Use the sliders to change assumptions. With every change of a slider or grid selection, hundreds of calculations are made as the thousands of Social Security rules are applied to compare options, suggest the best filing strategy, and show the lifetime difference. 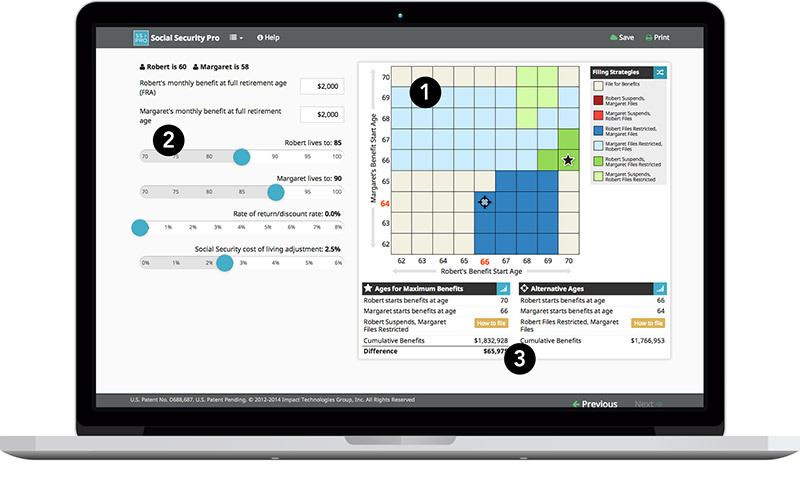 Social Security Pro is backed by Impact's 33 years experience creating financial planning software. Thousands of rules and calculations are no excuse for a complex interface or presentation. Good software does the hard work behind the scenes and creates a presentation your client can understand easily. Impact excels at making the complex simple. Social Security Pro is the perfect example. Social Security Pro's printed presentation clearly explains and compares filing options. Carefully researched graphs and charts guide your client through options. The professional design keeps your clients engaged and enhances your professionalism. 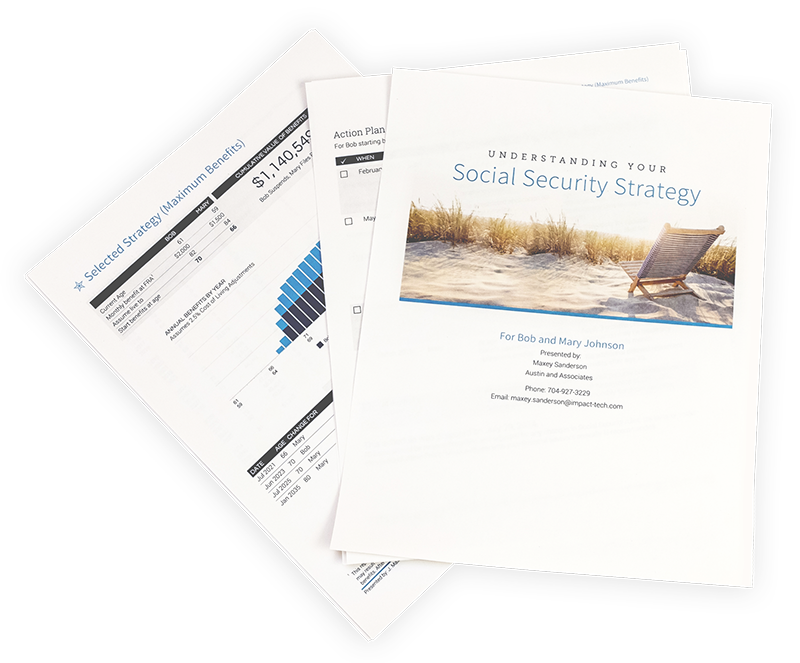 Social Security Pro includes a robust detailed Action Plan. Clients are guided through the filing steps. They will know what actions to take, when to do it, and why. The complexity of various filing methods are reduced to a series of steps arranged by date. Clients can just check them off when done and they'll know when the next action should be taken. Good design makes a positive impression, even if your client's don't understand design as professional designers do. Your clients are much more likely to actually read it, understand it, and act on it. There's so much more we could say, but nothing beats trying it out for yourself. Use our 14 day free trial to experience the advantage "Pro" software gives your practice. Already have a subscription? Click here to activate your Impact PlanFacts subscription. Your credit card will not be charged for 14 days. We'll email with cancellation instructions before you are charged. Join our weekly live webinars to jumpstart your success and discover how to turn Social Security questions into Life and Annuity sales.